Approved elementary school boundary revisions for fall 2019. Image courtesy of Everett Public Schools. 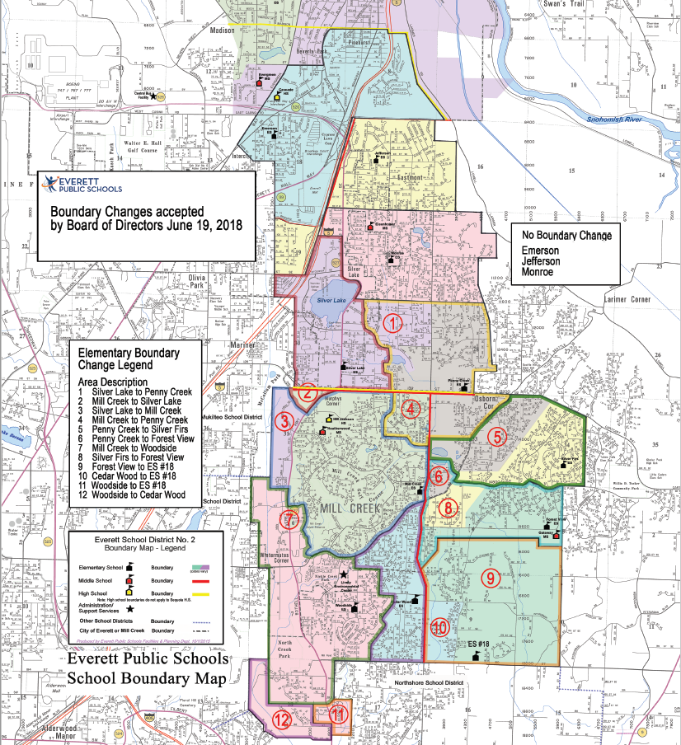 At its June 19, 2018, meeting, the school board approved elementary boundary revisions for fall 2019 which include the Elementary Boundary Committee’s recommendations to the superintendent. Also included was one adjustment suggested by the superintendent that shifts the southern boundary of Forest View Elementary School. This additional adjustment better communicates the boundary committee’s intent that driveways exiting on South 156th Street go to Forest View. The school board did not approve the superintendent's suggestion to keep students living in the north east corner of Mill Creek at Mill Creek Elementary School. Students living in Area 4 on the boundary map will attend Penny Creek Elementary School in fall 2019. It is estimated 1,370 current students will move to a different school with approval of this boundary revision in fall 2019 when Elementary No. 18 opens. The revisions are designed to create a service area for Elementary No. 18 and help to balance overcrowding of elementary schools in the south region of the district. Finalizing elementary boundaries before school is out, instead of next fall, allows families and schools even more planning and transition time for fall 2019. In April 2016, voters said “yes” to building a new elementary school to help alleviate overcrowding in the district’s southern region. Elementary No. 18, under construction now at 180th Street SE, will open in fall 2019. The Elementary Boundary Committee, including parents and staff, began work in November 2017 to draw boundaries for the new school and to adjust boundaries for elementary schools in that region to balance school enrollments. The committee studied student enrollment and school capacities and used that information to develop its recommendation for the superintendent on new school boundaries. The committee collected input online through May 25, which the superintendent considered in developing his final recommendation. Move Area 4, located just south of 132nd Street SE along 35th Avenue SE, back to Mill Creek Elementary School. Shift the southern boundary of Forest View to better align with the boundary committee’s intent that driveways exiting on the south side of South 156th Street go to Forest View. The board accepted only one of these two proposed revisions in its final decision—it did not approve moving Area 4 back to Mill Creek Elementary School.